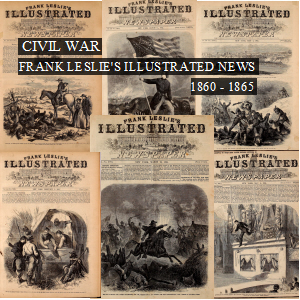 3,700 pages of Frank Leslie's Illustrated Newspaper covering the Civil War years of 1860 to 1865. Every issue published from November 24, 1860 through January 5, 1861, March 2, 1861 through June 20, 1863, July 4, 1863 through September 19, 1863 and January 2, 1864 through September 16, 1865. Henry Carter (he later changed his name to Frank Leslie) was born in England in 1821. In 1842, he went to work in the graphics department at the Illustrated London News. The Illustrated London News was the world's first illustrated weekly newspaper. In 1848, Leslie came to the United States and worked at different newspapers including Boston's Gleason's Pictorial and P.T. Barnum's Illustrated News in New York City. He began his own publishing venture and produced the first issue of Frank Leslie's Illustrated Newspaper in 1852, which later changed its name to Leslie's Weekly. The newspaper was published until 1922. 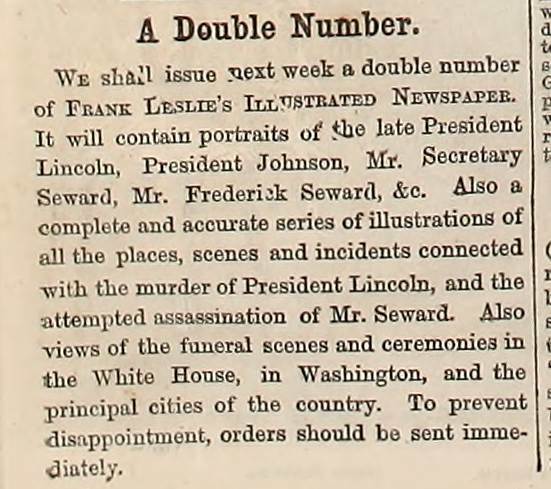 Long before television or the internet, many Americans received visual information about current events from illustrated newspapers such as Harper's Weekly and Leslie's Illustrated News. The method for the printing of photographs in newspapers was not adequately developed until 1880. 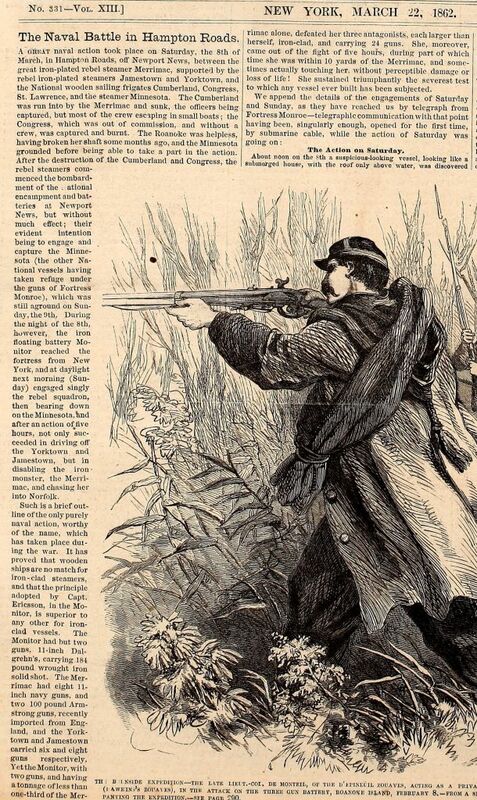 During the Civil War Leslie's Illustrated News illustrators including Edwin Forbes, Frank Schell, and Alfred Waud provided the only visuals many could view of the war. During the Civil War the newspaper held a pro-Union, pro-Republican stance. To cover the Civil War, Frank Leslie's Illustrated Newspaper had a "special artist" with each division of the Union army. Illustrations were also developed from sketches drawn by volunteers and the newspaper's correspondents. 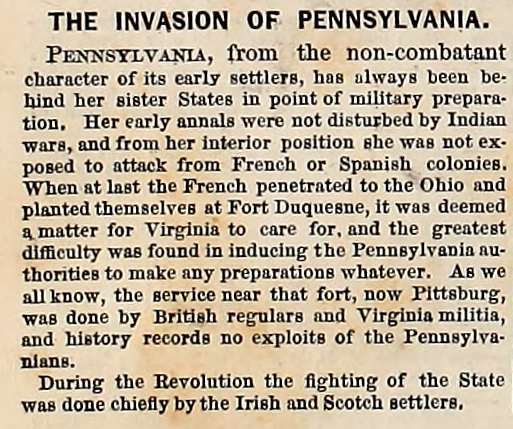 In the first issue of its 16th volume, the paper wrote of its Civil War era coverage, "During the whole of this momentous struggle for National existence, we have had our own accredited Artist with every expedition, as well as with every regular army, besides numerous volunteer correspondents, who have kept us fully advised of every incident great and small of the eventful crisis. But our War Illustrations speak for themselves and demonstrate that they are the most truthful and spirited ever published. In addition to these War pictures, we publish authentic representations of all current and important events, local and national, with brilliant and original works of fiction, poetry, a comprehensive epitome of the news of the week, foreign intelligence, and other interesting reading matter." 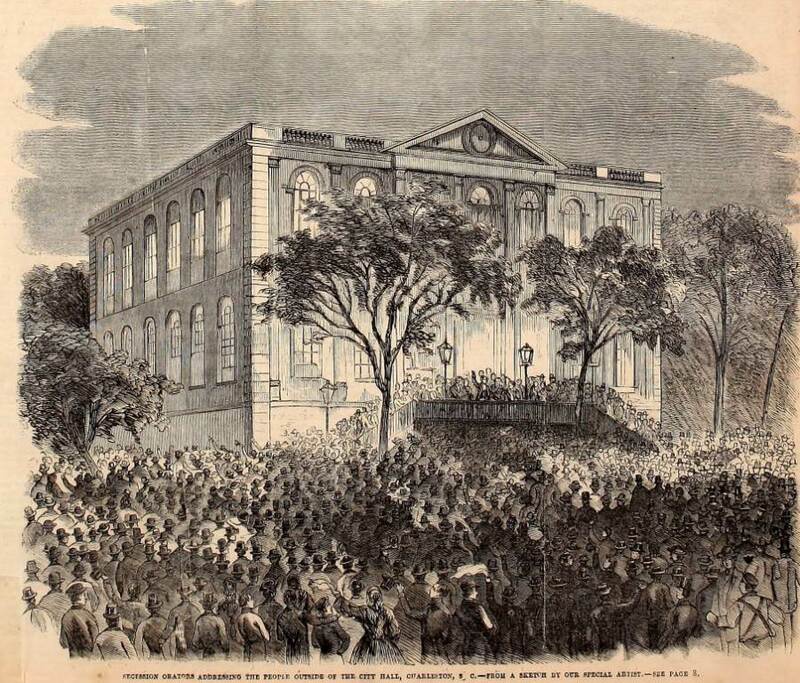 Caption: Succession orators addressing the people outside the City Hall, Charleston, S.C. - November 24, 1860 issue of Frank Leslie's Illustrated News. 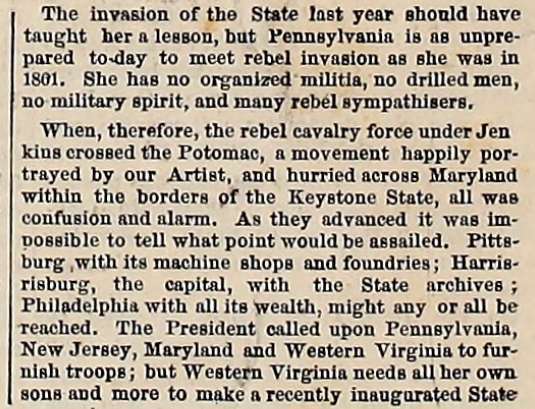 "Ever since the vote of the 6th of November, which indicated beyond peradventure that the candidate for the Republican party would be the next President of the United States, there has been a wild excitement and a terrible agitation in our sister States of the South. Even before the vote which settled the doubt, many Southern politicians looked upon the result as a foregone conclusion, and had prepared the minds of their constituents for an organized and determined resistance. So the feeling had been growing and growing, fanned almost to a premature fire by the sneering insulting tone of too many of the Northern papers, until the public mind at the South was fully prepared for some prompt, definite and determined action. South Carolina led the van in opposition to the assumption of power of that party so obnoxious to the sentiment of the entire South. Her State Legislature has authorized a Convention, to meet on the 17th, to deliberate upon the present state of affairs and decide what course of action the State shall pursue. Popular indications seem to point to immediate secession as the only means of allaying the feverish excitement of the people. In Charleston and Columbia meetings take place daily and nightly. Distinguished public men address excited crowds from the steps of the public buildings. From the windows of the hotels, and at the corners of the streets. The language of the speakers Unmistakable, and those who speak the loudest for immediate dissolution are the most enthusiastically cheered. 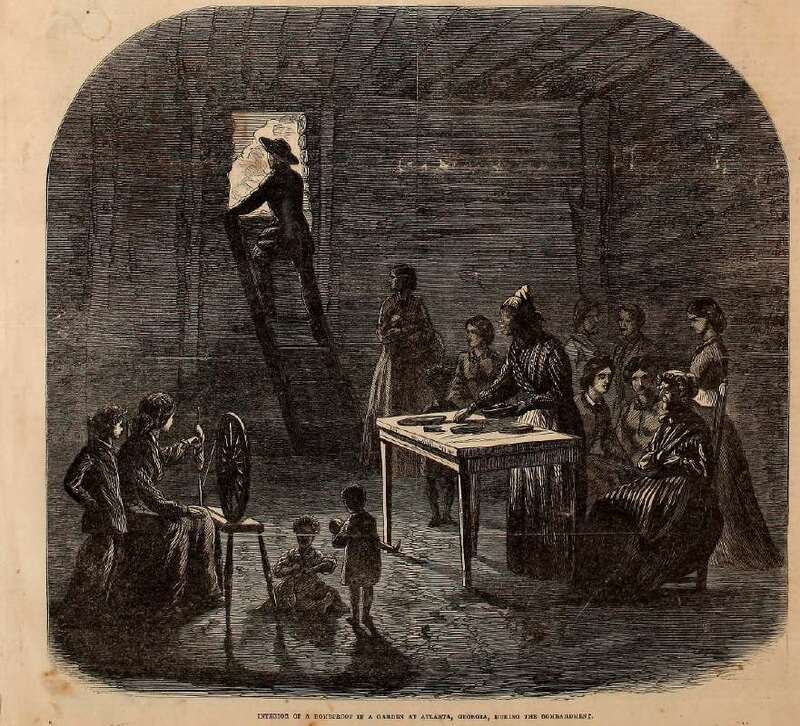 A large proportion of the Federal officers have resigned, and are to be remunerated by the State for their sacrifice for the cause of right, and it is said that their course will be followed by every official, Postmaster, &c, now holding positions under the Federal Government. Senators Toombs, Chestnut and Hammond have resigned." This important document, upon which was supposed to hang the fate of our beloved Union, was read by President Lincoln from the steps of the Capitol on Monday last, the 4th of March. Avoiding all minor questions, he enters at once upon the present state of the country. He denies that the South has any just fear that his Government will prove inimical to their property, their peace or their liberty, and offers in proof thereof extracts of a conservative spirit from his speeches, and one plank of the Chicago platform, based upon the sentiments therein expressed. These he deems sufficient proof of his friendly feelings and just sense of his obligations towards the South. Of the right to reclaim Fugitive Slaves, he considers it recognized, in the fullest sense, in the Constitution, a right which all Members of Congress swear solemnly to support. Whether this right should be enforced by the Federal or State Authorities, he believes could be easily settled by calm discussion. He asserts that 'no Government proper ever had a provision in its organic law for its own termination.' Dissolution is, therefore, impossible, unless with the consent of all the contracting parties." The Bombardment of Fort Sumpter by the Forces of the Southern Confederate States. 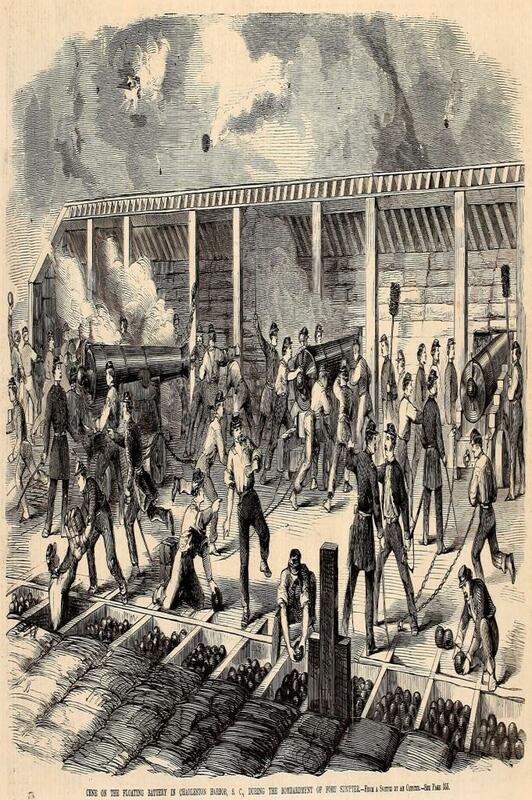 Seven Batteries concentrate their fires on Fort Sumpter. THE FORT SEVERAL TIMES ON FIRE. Surrender of Fort Sumpter after Forty Hour Bombardment. Sumpter, and were being replied to vigorously by Major Anderson. The report ran through the city like wildfire. Not more swiftly did the electric fluid flash the message over the lines than did the news fly through the length and breadth of the city. On Saturday morning the city was in a state of the wildest agitation. 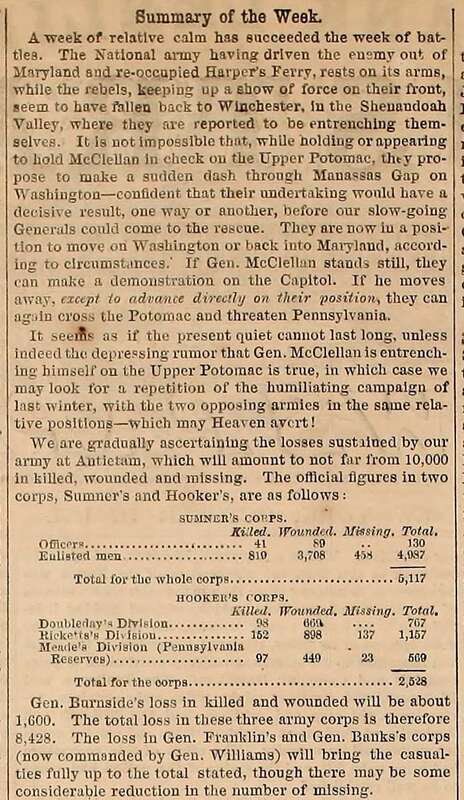 By many the news was utterly discredited as it reached us through a means which was entirely in the control of the Confederated authorities; but the majority felt a solemn conviction that, although some of the details might be exaggerated, the leading points were founded on facts, and that the most terrible of all calamities, civil war, was at last commenced in earnest." Harbor, and the coverage of events by Frank Leslie's Illustrated Newspaper. The advance of the Grand Federal Army towards Manassas Junction was the signal of great rejoicing throughout the loyal part of the country. Successively as they advanced, the rebels retreated before them and Fairfax Court House and Centreville fell into the hands of our troops and on Saturday morning at half past two, the whole army, with the exception of the reserve, advanced towards Bull's Run, which was strongly fortified by masked batteries and is about three and a half miles in advance of Manassas Junction. The advancing army numbered forty-five thousand men." 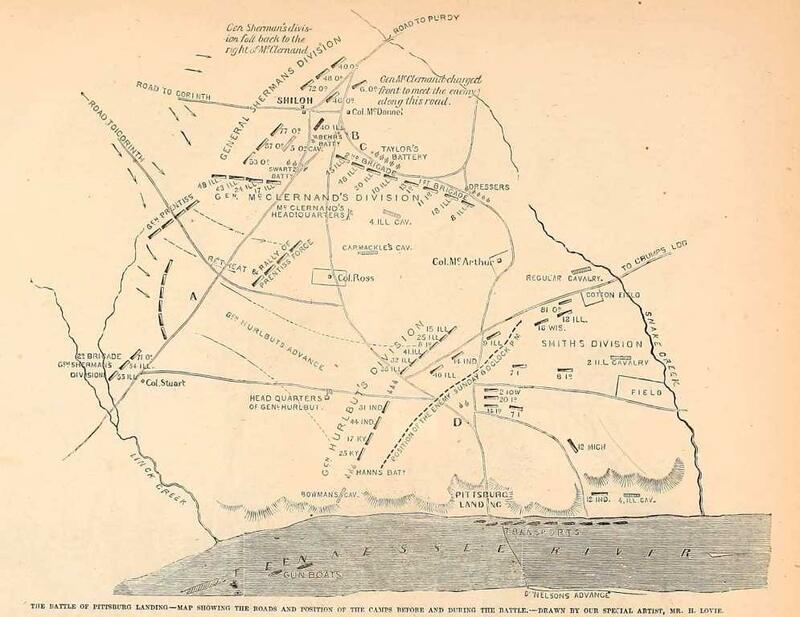 The Battle of Pittsburg Landing - Map showing the roads and position of the camps before and during the battle. 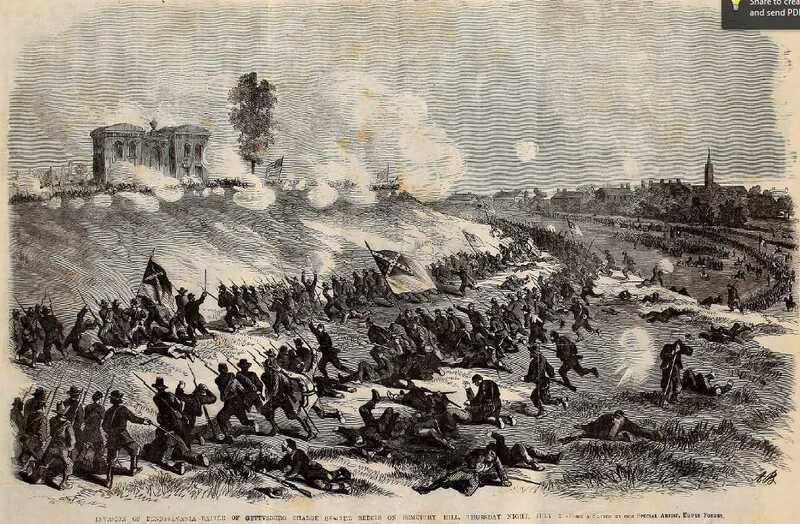 Caption: Battle of Antietam, Maryland--Burnside's division carrying the bridge over the Antietam Creek, and storming the Rebel position, after a desperate conflict of four hours, Wednesday, September 17. "THE DRAFT RIOT IN NEW YORK. "New York has been disgraced by a terrible riot unparalleled in her history, and attended by circumstances that probably never dishonored a mob in any city of the world. The Conscription Law passed by Congress, though of doubtful legality and a more than doubtful policy, was at last to be enforced. Over 30,000 reluctant men, to be selected by lot, were, by the power of the law, to be forced at once from their homes in the city to the ranks of the army. It was a step the magnitude of which would appall the strongest Government, but here it was expected that it could be carried out without difficulty. Tokens and signs had not been wanting that showed how certainly trouble would ensue, yet the authorities took no steps to protect the officers charged with the execution of the law." Interior of a bombproof in a garden at Atlanta, Georgia during the bombardment. 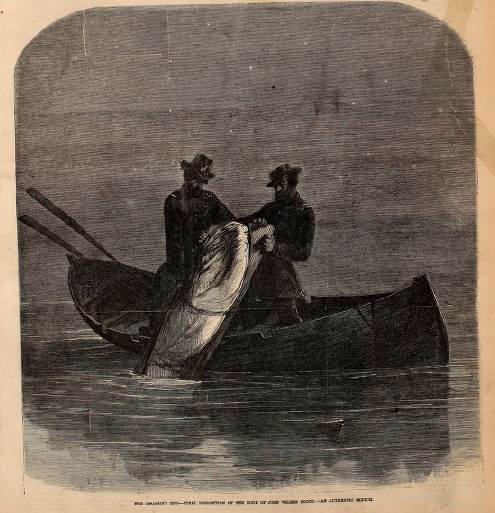 Above the illustration below in the May 20, 1865 issue of Leslie's illustrated was written, "The sketch below was furnished by one of the two officers employed in the duty of sinking the body of Booth in the middle of the Potomac. Although not authorized to divulge his name, I am able to vouch for the truth of the representation. New York May 10th 1865. (signed) F. Leslie."